Now you see me know you dount. You will have to find out. NINJA ..... not the Lego Stuff! I love Ninjas, i am a Ninja myself when it comes to nightly refrigerator robberies! 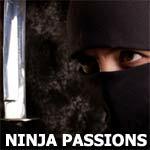 But i more love Ninja-Girls that feel the sneakyness and stealthyness in everyday live! Try to steal something from me, but let me stay alive after all!! Does cosplayingisfun belong in this group?